Candlestick forms can demonstrate the power of emotional or psychological traders on trading binary options we can use this kondsi to know the direction of price movement. 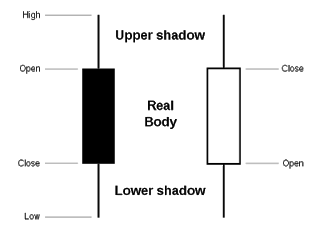 A long candlestick's body showed a strong purchasing power on a white candlestick. 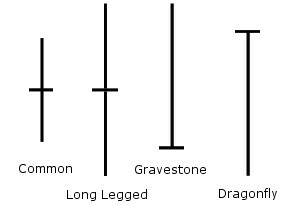 Candlestik body short of his shows there was uncertainty in the market candlestik is called a Doji. 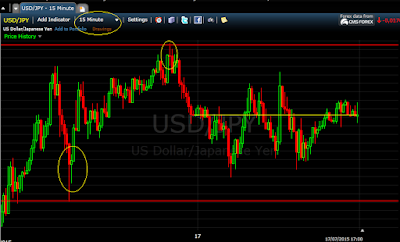 It often happens when formed the Doji reversal will occur. When a POPs candlestik Doji this is an indicator of his reversal of direction will happen of course we have to wait for the comfirmasi of candlestik following him. For setting chart you can use MT4 and Freestockchart use the 15 minute time frame when you are trading binary options with expired 5-15 minutes. and the lowest price (support). When price touches the line support and formed Candlestick Doji candlestick waiting his first when Green took the position of the Call because the price will go up. Behind him when price touches the top or line resistance and formed candlestik Doji candlestick following his waiting when formed red candlestik take the position Put because the price will go down.